She's Fantastic: Women of Halloween Part 9 - SHAYA! Shaya is the Queen of Power, and brother to Adam, the King of Power. Their storyline (from comics and cardbacks) is a classic story of revenge as they battle the aliens who killed their parents. They transform into the King and Queen of Power by way of Adam's jewel and Shaya's third eye. 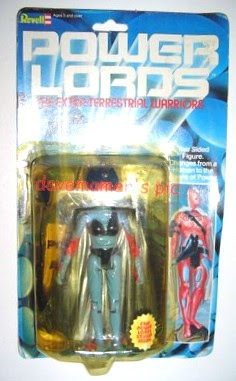 Power Lords: The Extra-Terrestrial Warriors! I'm embarrassed that I didn't notice her loincloth was so askew. Disregard the peepshow please. Her cape is awesome. She is the only character in the line with a cape which is surprising since it's such a simple and effective way to disguise the alien form. The cape is made of really rigid plastic and actually looks like a cape! (a small gripe I ave with a lot of modern capes these days). I'm not 100% positive how her helmet/headdress is supposed to fit on her head. I think it looks best they was I showed it in the majority of these pictures, but I think perhaps it's meant to sit back and show her third eye. Ready for the gross-out moment?? I realize now after I took this final shot, that her true Queen of Power form should not include the headpiece and her chestpiece should be spun around so just a single satchel-type bands cuts across her torso. You'll see what I mean from the graphic on this carded pic I snagged from an eBay auction. I have just discovered Shaya for the first time and an utterly thrilled to see such a bizarre female action figure. I can't wait to get one of my own to add to my collection of weird vintage toys!